The Samsung CF791’s pitch-perfect colors change the game for ultrawides. When you’re seated in front of a curved ultrawide monitor, games like Deus Ex: Mankind Divided just commandeer your entire field of view, pulling you into another world. It’s easy to lose yourself walking the neon-bathed streets of a futuristic Prague while rain pours in thick, heavy sheets. It’s no wonder these monitors have started to become so popular. 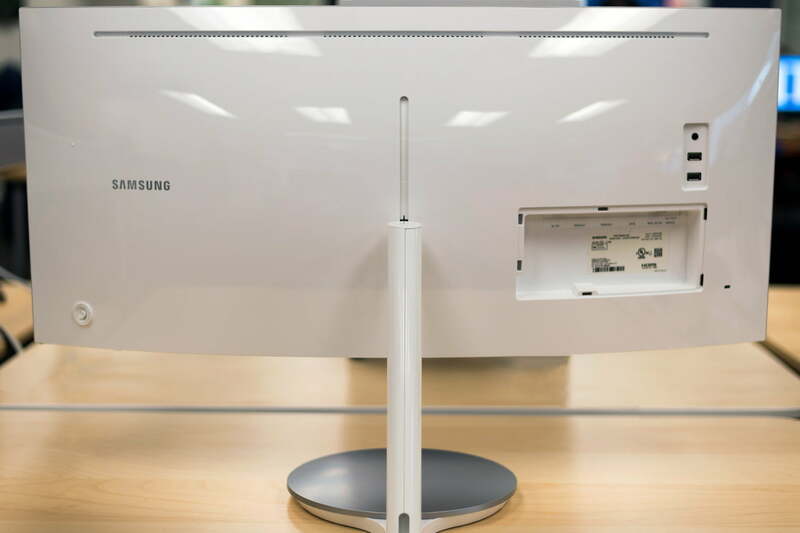 The Samsung CF791 is one such monitor. It’s a 34-inch, ultrawide monitor with a curve deep enough to wrap around your entire field of vision. Thanks to Samsung’s quantum dot technology, this monitor can deliver sharp, accurate colors at a much lower price than their OLED competitors. Because it’s been some time since its original release, the Samsung CF791 currently retails for just $750. At $250 off its initial price, it’s a value that’s hard to beat. Before you even turn it on, the Samsung CF791 cuts an elegant figure. A broad aluminum-colored disc supports a glossy white armature that seems to effortlessly hold the display aloft. It’s not often that a monitor’s adjustable stand is appreciably different from all the others on the market. It has a simple job — hold the monitor up, keep it stable, and don’t be a pain when you need to adjust the height or angle. It’s a straightforward but thankless job, and you only ever really notice the stand if it’s misbehaving — if your display is wobbly or if it never manages to stay at just the right height. Curved monitor manufacturers sometimes cut corners here, offering stands that are nice-looking but inadequate or stable but overly large. With the CF791, Samsung establishes a comfortable middle ground. The base is large but not too large. 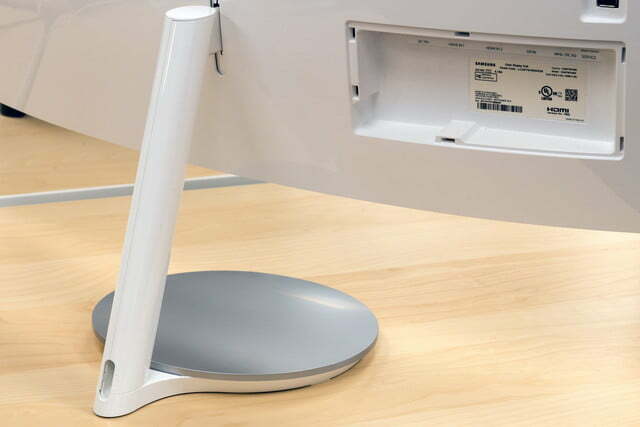 It provides stability without overreaching and taking over your whole desk. Despite the size of the base, it never seems overbearing, and the stability it brings to the monitor is a welcome addition. Ultrawide curved monitors have a bad reputation for being unstable, due to their size, but the CF791 proves a steady hand. A narrow, articulated armature clad in glossy white plastic sprouts from the back side of the base. This arm holds up the monitor, and accounts for the CF791’s impressive adjustability. 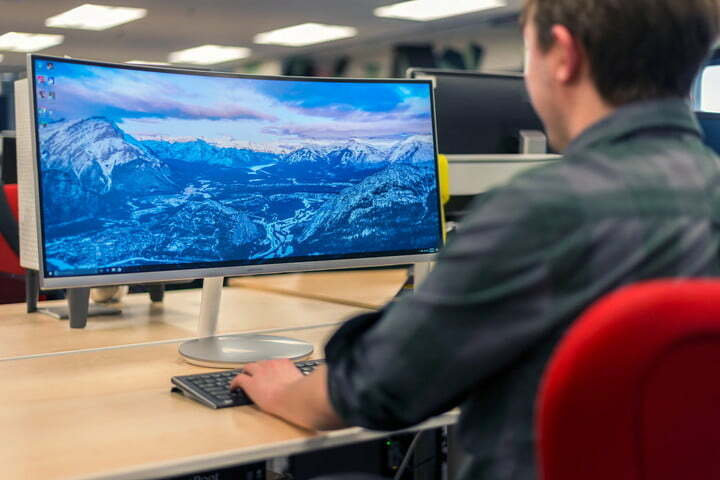 Every monitor is adjustable in some way or another, usually just a little up and down with some give to tilt it forward or back — and the larger but less flexible LG 38UC99 is an example. Usually, these adjustments produce audible clicks or require some muscle to get just right. Even when bright, vibrant rose-reds contrast well against stark, snowy whites. Again, the Samsung CF791 manages to improve on a simple aspect of the user experience that is very easy to ignore. 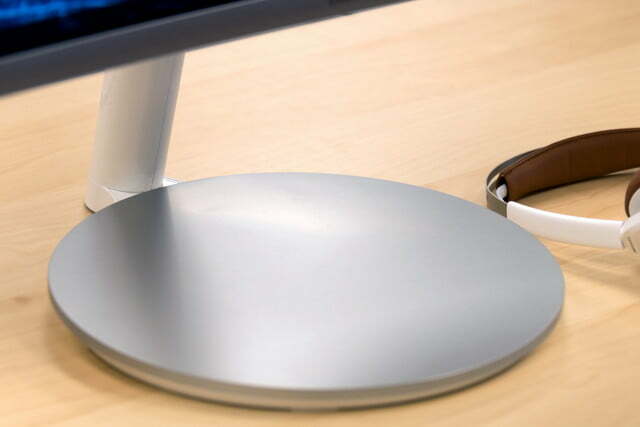 Adjusting this monitor’s big, curved display is easy. Not just that — it’s pleasant, which is a weird thing to say. 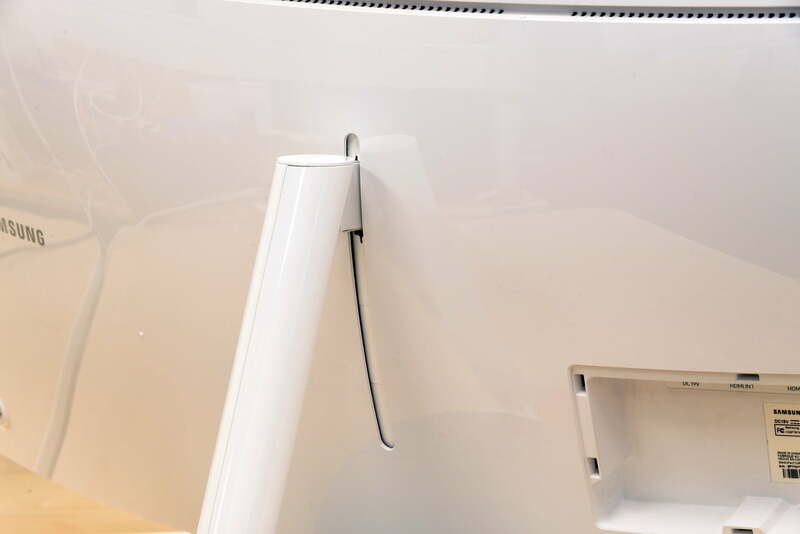 When you pull the display toward you, angling it up or down, the arm moves with just the right amount of resistance before settling into its new position. Once adjusted, the stand is remarkably stable. Tapping or nudging the display doesn’t change its position, nor does bumping the table or desk it sits on. The display itself only wobbles noticeably when directly jarred, or if you start shaking the table. 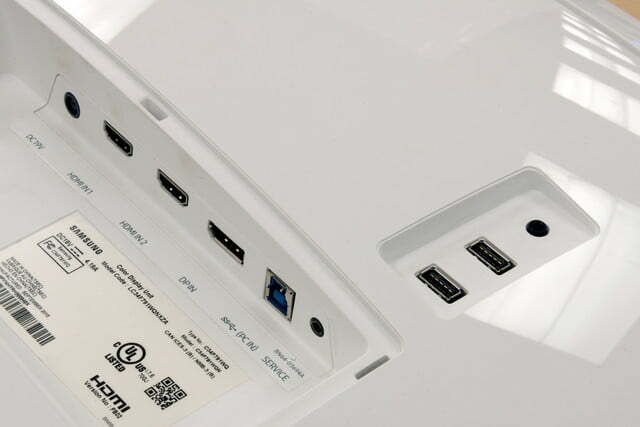 The CF791 features a standard array of connections and ports, including two HDMI 2.0 ports, one DisplayPort 1.4 port, and one USB port, alongside built-in speakers. It’s also VESA compatible, another nice, standard addition. Basic configuration is handled with a set of familiar on-screen menus accessible via the jog button on the back-right side of the monitor. It’s responsive, and it makes clicking through the menus easy enough, but like most jog buttons, you’re going to end up hitting the wrong setting now and then. It’s not exactly a precision instrument, and this is one area where Dell’s U3818DW does a better job. The menus themselves are easily navigable, clear, concise, and surprisingly robust. There are a lot of options here. 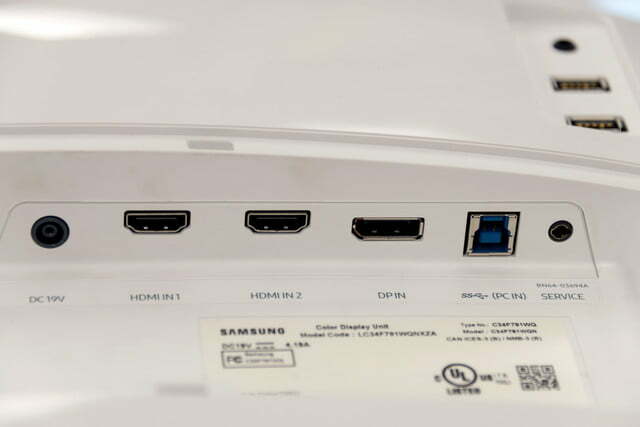 You can adjust your brightness, contrast, and individual color levels, also configure which version of HDMI or DisplayPort you want the monitor to be running (1.4 or 2.0) on each of the input ports, and you can toggle AMD’s FreeSync on or off. It’s impossible to discuss the Samsung CF791 without mentioning its overwhelming size. The CF791 supports a 100Hz refresh rate, even without AMD’s FreeSync, in case you don’t have an AMD video card. It’s a nice addition and definitely puts the CF791 in competition with other gaming monitors. The speakers get the job done, but they’re nothing to write home about. Playing music through them, you’ll end up losing most of the bass, and games don’t fare much better. Gunshots are sharp and snappy, but deep rumbly sounds get lost in translation. It’s impossible to discuss the Samsung CF791 without mentioning its overwhelming size. This is a big monitor. With a 34-inch diagonal wingspan, as well as a 3,440 x 1,440 resolution, the CF791 has a comfortable 110 PPI. 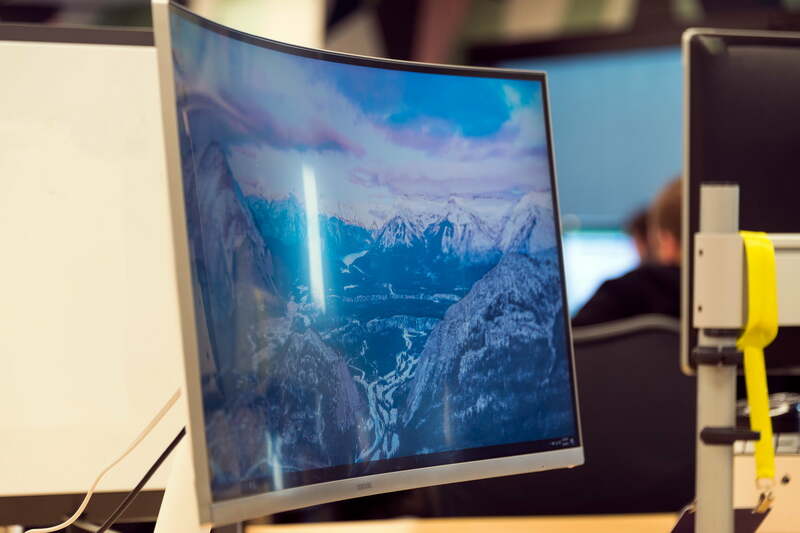 The deep curve makes the already impressive presence of the monitor even more dramatic. Just putting it on your desk makes your workstation look like a futuristic command center. Before we even cracked open our colorimeter and set about calibrating the CF791, we had to find some video content to test it with. This isn’t a 4K display, and it’s not 1080p. Of course, 1440p content is easy enough to find, but at an appropriate aspect ratio to really leverage the CF791’s ample screen space? Not so much. That’s actually something of a larger problem for the CF791. Games support its odd dimensions with ease, but streaming services like Netflix, HBO Now, and Amazon Video had trouble scaling video content without losing quality. HBO Now, in fact, had the most trouble scaling to the CF791’s enormous and unusual size, zooming in on one corner of the video and chopping off the rest. You might have better luck if you hooked up a game console or downloaded your favorite streaming service’s official app instead of streaming from your browser. The CF791’s quantum dot technology delivers unparalleled color depth and contrast ratios. This isn’t the monitor’s fault, and it’s a symptom you’re going to see on any monitor with a resolution a little outside the norm. The LG 38UC99 and Samsung U3818DW will suffer the same fate. If you’re in doubt, it’s best to just use 4K content on these monitors — browsers and streaming services are better at scaling down than they are at scaling up. Other than a handful of user-created videos on YouTube, finding content at a native resolution large enough to fill the CF791’s display was pretty difficult. It’s something you’ll want to keep in mind, especially if you plan on using this monitor primarily for media. Worse comes to worst, you’ll just find black bars on either side of whatever you’re watching, or you’ll have to temporarily lower your monitor’s resolution to accommodate the video content. Once we did track down some appropriately sized video content, 4K or 1440p, the Samsung CF791 exceeded our expectations in the most spectacular fashion. When you put it to work, this monitor is breathtaking. The specifications of this monitor alone would be impressive, but the CF791 has another trick up its sleeve: A technology called quantum dots that fills the screen nanocrystal semiconductors. The tech delivers unparalleled color depth, contrast ratios, and all sorts of other stimuli for your retinas. From edge-to-edge, the CF791 delivers rich, velvety colors. Watching a movie trailer, colors just cascade across the screen, reds leap out against deep, inky blacks, whites are sharp and stark. These colors don’t run, they don’t bleed, they are precisely where they need to be and they never stray outside the lines. Even when bright vibrant beet-reds are contrasted against snowy whites, the CF791 never misses a beat. It’s easy to see why — right out of the box, the CF791 sports an impressive 910:1 contrast ratio, and it displays 100 percent of the sRGB spectrum and 85 percent of the AdobeRGB spectrum with an accuracy of 2.56. What does that mean in practice? It means this monitor looks great, without tweaking a single setting. Pull it out of the box, plant it on a desk, fire it up, and you’re done. You don’t need to mess around with contrast settings to pull the most out of this monitor — it’s not shy, it doesn’t need coaxing. Compared to Samsung’s previous 34-inch curved monitor, the S34E790C, the CF791 is an improvement on an already great product. The new design all but eliminates the bezels around the screen, deepens the curve, and shatters the S34’s impressive contrast ratio of 740:1 with its own 910:1 contrast ratio. Gamma is fairly middle of the road, coming in at 2.1. Basic calibration of the CF791 lands you nearly pitch-perfect, professional-grade color accuracy. Brightness maxes out at about 297 lux, and black levels are appreciably deep — moving up to only .32 at full brightness, and 0.0 at the lowest brightness setting. What does that mean for your display? Just that your highlights and lowlights, your bright patches and shadows will remain nicely differentiated no matter your brightness setting — a credit to the CF791’s fantastic contrast ratio. 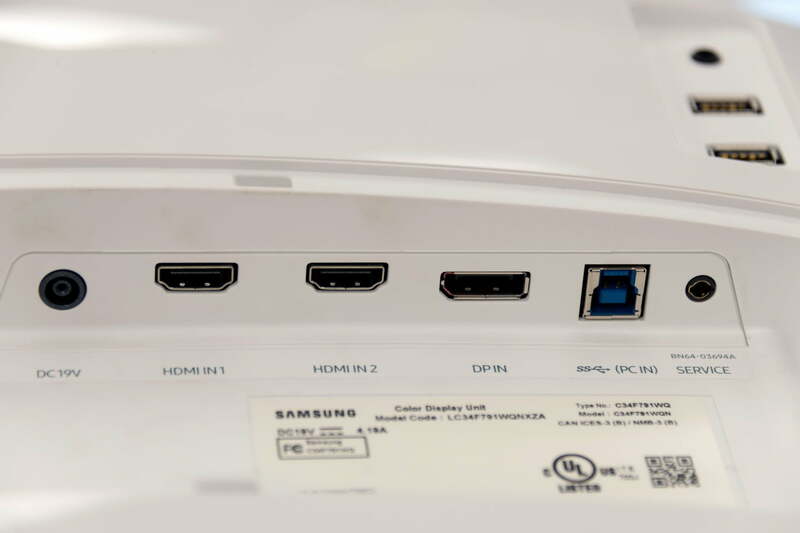 How did Samsung do it? Well, that contrast ratio is the result of those quantum dots, which handle color much more efficiently than standard LCD displays. They’re essentially molecular-sized prisms that bend light to different colors (frequencies) depending on their size. These nanocrystal semiconductors act as a filter between the LCD’s backlight and the display, ensuring that colors go where they need to, when they need to, and nowhere else. Those quantum dots manage to push the CF791 ahead of the competition, without inflating its price tag. For instance, the LG 38UC99 boasts an impressively high brightness level of 300 lux, and a 38-inch screen, but it’s 660:1 contrast ratio doesn’t come anywhere near the CF791’s impressive 940:1 contrast ratio. Speaking of contrast, the CF791’s contrast ratio easily eclipses what we saw out of HP’s more recent ultrawide, the Z38c — which topped out at 630:1. That’s particularly impressive because the CF791 came out in 2016, and the Z38c came out in early 2018. The Z38c does feature slightly better color accuracy, coming in at 2.01 average color error to the CF791’s 2.56 It also beats the Z38c in color gamut, hitting 85 of the AdobeRGB spectrum, compared to the Z38c’s top score of 74 percent. Even more than a year down the road, the CF791’s quantum dots make its colors sharper, more vibrant, and more accurate. Let’s see if we can make them work a little harder with some calibration. Normally, calibration can help gloss over a monitor’s shortcomings — you can give that color accuracy a boost, and fix off-kilter gamma, but that’s usually about it. Expecting anything other than a minor improvement is unrealistic — most of the time. The Samsung CF791 is just full of surprises. While the out-of-the-box color accuracy is not ideal, coming in at 2.56 (anything lower than 1.0 is undetectable to the human eye), running it through a basic calibration lands you nearly pitch-perfect color accuracy — about 1.08, which is just a few decimal points away from professional-grade color accuracy. Thanks, quantum dots. The CF791 also avoids a common pitfall of curved ultrawide monitors — the dreaded light bleed. Throughout our tests, even when we were trying to reproduce some common light bleed, the CF791 maintained its inky darkness even with a fully black — but active — screen. 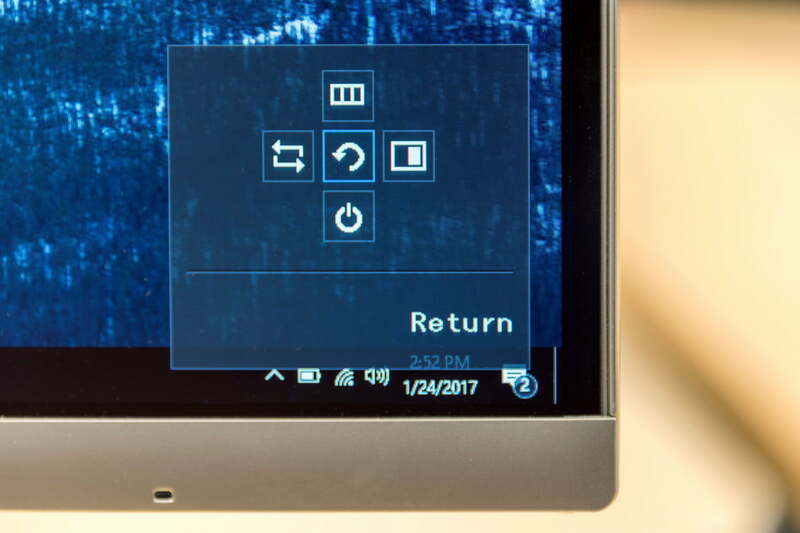 No light bleed around the corners, none along the top or bottom edges. In this regard, the CF791 is again able to run circles around some of its high-end competitors like the HP Z38c and the LG 38UC99 which fared better than most curved monitors, but still had some unsightly light bleed around the curvature of the screen. Before you even turn it on, the Samsung CF791 cuts an elegant figure. Calibration also helped out contrast just a bit. In our tests, the precalibration contrast ratio of 910:1 went up just slightly to 940:1. Brightness and black levels remained pretty much the same, pre- and post-calibration, but those gains in color accuracy are definitely worth the trouble of calibration. If you don’t have access to a professional colorimeter, worry not. You can check out our calibration guide here for some tips on how to get the most out of this — or any other — monitor. The Samsung CF791’s color accuracy manages to edge out a few rivals, including the Samsung S34E790C, which comes close, but doesn’t quite match the CF791’s stellar accuracy. In fact, the CF791’s post-calibration color accuracy actually comes close to the accuracy you’d find on a professional-grade monitor like the BenQ SW2700PT, which features out-of-the-box color accuracy of .84. The Samsung CF791 comes with a standard one-year warranty for parts and labor, covering manufacturer defects in materials and workmanship, but only guards against noncommercial use. It’s not an unusual warranty, it’s just a little sparse. The Acer Predator Z35, for instance, features a three-year warranty, which is much more common for high-end monitors. If you purchase a CF791, you might want to pick up some kind of device insurance or extended care plan from a trusted retailer — the included warranty has a lot of caveats. Ultrawide curved monitors are impressive to behold. They just look great. They’re aesthetically pleasing, they create a luxuriant workspace that supplants typical two-monitor setups, and they’re immersive. Size and scope often compensate for any shortcomings a typical ultrawide monitor might have. 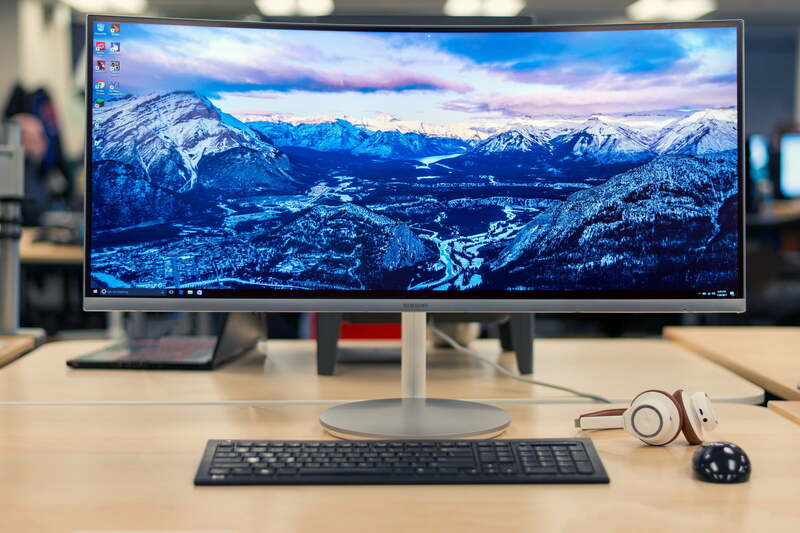 The Samsung CF791 isn’t a typical ultrawide monitor. It doesn’t really have any shortcomings. It doesn’t need to compensate for anything, because it delivers in every way you need it to. It’s a gaming monitor that upgrades your workspace, and a workspace that delivers stellar gaming performance. But it’s a little over a year old now, and it’s still the best one you can buy. Simply put? No, there isn’t a better alternative. The CF791 sits comfortably in the Goldilocks zone when it comes to price, performance, and image quality. There’s the Acer Predator Z35, if you need a blisteringly fast refresh rate, but you’ll lose out on that deep curve and the rich contrast provided by the CF791’s quantum dot display. Similarly, you could pick up the LG 38UC99, a 38-inch IPS monitor, which delivers an immersive experience with a massive panel, but less-than-impressive contrast. It’s also significantly more expensive at $1,300. That’s almost double the CF791’s current price of $800. We’re in a unique period when it comes to consumer technology, particularly monitors. Resolutions continue to ramp up, year over year, but for most uses, we’ve reached a comfortable plateau. For instance, 4K displays have trouble with icon scaling and text because of their overwhelming pixel density. On the other hand, 1440p is a happy middle ground between 1080p and 4K — it’s a safe place to be for quite a while. The Samsung CF791 has two major advantages that will contribute to its longevity. Its size, which is unlikely to be eclipsed any time soon, even more than a year after release. After all, monitors might keep getting bigger, but desks sure don’t. You only have so much space available for a monitor, and the CF791 just barely scrapes the ceiling on that front. Second, the resolution and pixel density are pitch-perfect for text. Pixel density is high enough that text and icons aren’t visibly pixelated — they’re sharp and smooth like a pen stroke — and the resolution is capable of approximating 4K content without too much difficulty. After all it’s only 400 pixels shy of 4K. In short, the Samsung CF791 will last an awful long time. It’ll outlast most of the components in your PC, and continue to deliver immersive gaming experiences long after you replace your brand-new video card. Yes, you should. It’s expensive, but for what you get, it’s a good deal. The Samsung CF791 will outlast your current gaming rig, and if you’re buying it for a general use PC, it’ll last even longer — as a workspace, 21:9 is fairly cutting edge. Samsung has outdone themselves with the CF791, and with a below average retail price, this is one monitor you don’t want to pass up.